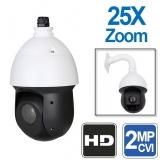 PTZ cameras allow surveillance of a large area with a single security camera. 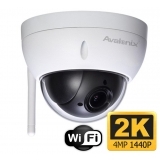 Our mobile apps and PC software allow you to remote control these pan-tilt-zoom cameras from anywhere in the world. With easy to use controls on the mobile app you can command where and how far the PTZ camera is looking. Our PTZ cameras are built with reliable pan-tilt motors to quickly move and focus on different objects in the scene. 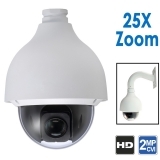 Our high speed dome cameras feature rapid panning and tilt speeds, and endless 360° rotation. You can use the optical zoom to focus on distant objects like license plates or capture facial detail up to hundreds of feet away. 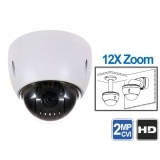 At CCTV Camera World we offer a large selection of professional PTZ security cameras for use with our Security DVRs and HD NVRs, all of which allows the user to set multiple presets and patterns to monitor a large area. You can choose high definition PTZ cameras below ranging from 1080P or 2K, all the way up to 4K resolution. 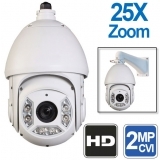 Our PTZ security cameras will change the way you think about monitoring a large area. Combine high definition video with video analytics for smart event detection and automatic control of the camera without the need for user interaction.